The mathsassess national research project was led by three institutions: University of Melbourne, University of Western Sydney and Monash University. The project was funded by the Australian Government Office for Learning and Teaching (OLT). The research team required a print and online resource to communicate their research findings and recommendations. The aim of the printed guide and website was to support criteria based assessment design across all Australian universities, in a useful and practical way. The mathsassess guide needed to be attractive, engaging and easy to pick up and use. In pre-production I worked closely with the academics to devise a creative approach that communicated appropriate rubrics and assessment approaches in a friendly and engaging way. A key approach involved the use of a straight-forward narrative structure which would serve as a meaningful/interesting context for the project learning outcomes. As part of my process, I analysed project content/aims/outcomes to design a suitable production approach. During production/post-production I liaised with academic content writers, captured a video interview, developed the mathsassess website, coordinated photography, design, printing and delivery to the 2014 Australian Conference on Science and Mathematics Education ACSME conference. 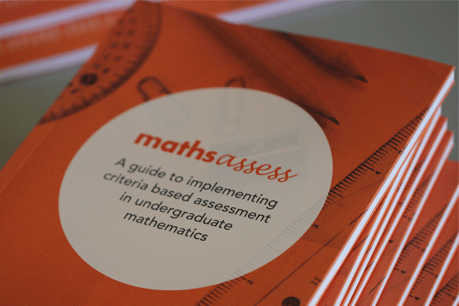 The mathsassess website – including mathsassess PDF – is available for all academics in higher education to incorporate into their local criteria based assessment strategies.